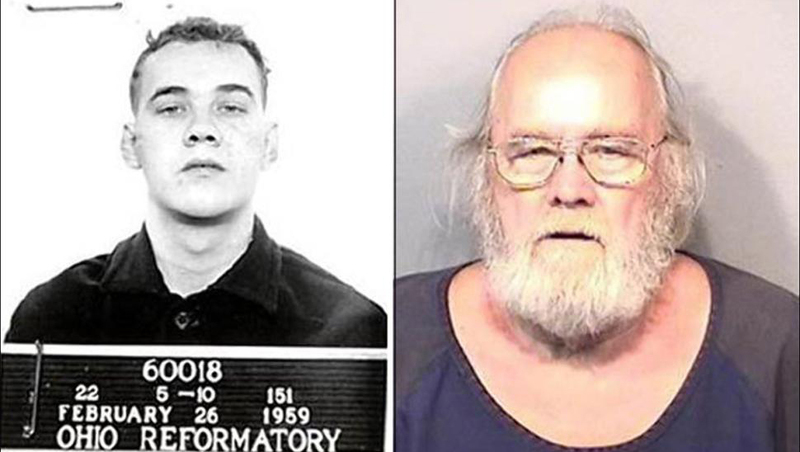 ORLANDO, Fla. - A convicted killer escaped from an Ohio prison farm in 1959, then was allowed to slip away from law enforcement in 1975, and disappeared again for another 30 years until a ruse to get his fingerprints led to his arrest in Florida this week, investigators said Tuesday. Former Akron, Ohio, resident Frank Freshwaters, now 79, admitted his true identity when authorities confronted him Monday, according to the U.S. Marshals Service and deputies in Brevard County, Fla.
An old picture of Freshwaters came into play, when, after a week of surveillance, authorities confronted him with a question as he left his trailer in a rural area near Melbourne: Have you seen this man? "They showed him the pic, and he said he hadn't seen that guy in a long time," Goodyear said. "Then he admitted it and basically said, 'You got me.'" "It's a nice place to kind of hang out by yourself if you don't want people to know you're there," Goodyear said. Freshwaters had retired from a job as a truck driver and was living off Social Security benefits, Goodyear said. "We have a saying in the Marshals Service, 'Let no guilty man escape,' and that is so true in this case," Elliott said. Freshwaters was convicted of manslaughter for killing a pedestrian with a vehicle in July 1957, and received a suspended sentence of one to 20 years in prison. The prison sentence was only imposed in 1959 after he violated his probation by driving and getting a driver's license, according to the marshals and old court documents they provided. Freshwaters was imprisoned at the old Ohio State Reformatory before being moved to a lower-security camp near Sandusky, where he escaped in September 1959, the statement said. His time on the lam was interrupted in 1975, when he was arrested on the Ohio warrant by the sheriff's office in Charleston, West Virginia. When the governor there refused to send him back to Ohio, he was freed and disappeared again, the marshals said. The Brevard County Sheriff's Office said he was jailed under the name Harold F. Freshwater and was ordered held without bond because of his status as an out-of-state fugitive. Court records listed no attorney for him as he awaited a hearing about possible extradition to Ohio.